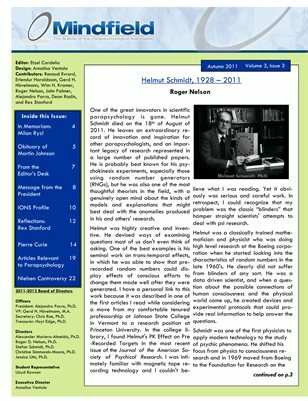 In this issue: Memorials of Helmut Schmidt, Milan Ryzl, and Martin Johnson, an article on Pierre Curie, the Nielsen controversy, profile of the Institute for Noetic Sciences, message from new PA president Alejandro Parra, Rex Stanford reflects on his career in parapsychology, and a bibliography of more articles relevant to parapsychology. I agree we should be able to print the newsletter. On another matter I must say I have been enjoying Mindfield greatly. The newsletter has a good balance with materials of current interest as well as perspectives from the past. Gerd Hovelmann's bibliographies are very useful and remind us of the variety of topics and disciplines relevant to parapsychology. I was just alerted by a member that Mindfield cannot even be printed by members, a policy that I disagree with. I have asked the Board to revisit that issue, as has John Palmer with regard to the JP.